When Melissa Zelazny was a student at the University of Vermont in the early 1980s, she ate a lot of macaroni and cheese. Zelazny was a runner and hurdler on the track team, and eating carbohydrates was standard practice for runners. And that was the kind of food readily available in the dining halls. "You didn't have a lot of choices," Zelazny said. "Fried clam strips and French fries at Living/Learning [Center] was a staple." As a student athlete, she got little guidance about diet. "There wasn't much instruction back then," Zelazny remembered. "I think it was just: Maintain your weight and have enough energy to run." Zelazny grew up in a farm-to-table family in South Barre, one of nine siblings who ate beef raised by her father and vegetables grown in the family garden. She graduated from UVM in 1984 with a degree in nutrition and dietetics. She worked for 18 years at Yale New Haven Hospital in Connecticut, where she was a registered dietician and food service manager. For the past 12 years, Zelazny has worked at her alma mater, where she is a resident district manager for Sodexo and director of dining at UVM. 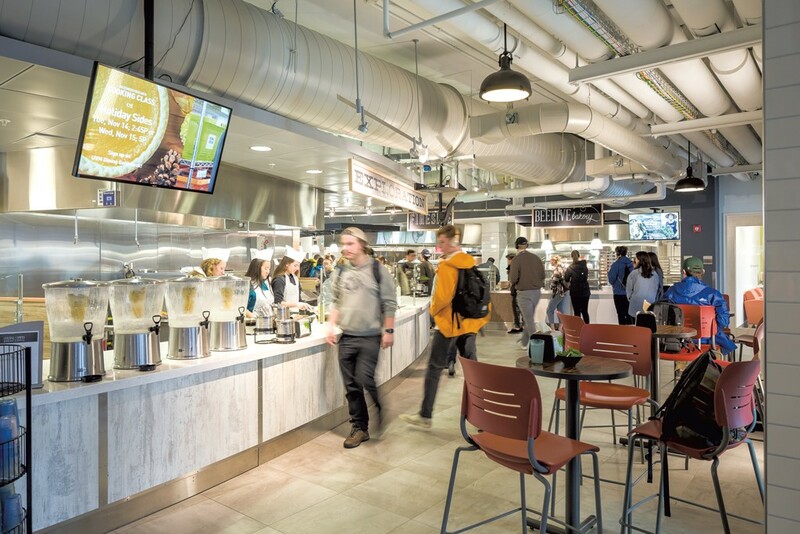 Zelazny oversees about 450 dining and food service employees, including 65 or so who work at UVM's new Central Campus Dining Hall. Located, as its name suggests, in the middle of campus, the facility seats 450 people, serves nearly 20,000 meals a week, and offers a range of things to eat and places to dine. It also has a learning component, with an associated culinary education center called the Discovery Kitchen. At the dining hall, students can eat at dual-purpose stainless steel tables in the teaching kitchen — they double as cooking counters during class — or sit at a communal farm table near the center of the room. They can gather in foursomes at restaurant-style booths that occupy a space off the main dining room or in high chairs at one of several counters situated in the room. Diners can order food from a grill, serve themselves at a salad bar, eat at an allergen-free station, or even sauté their own veggies and chicken. "There's so much more choice," Zelazny said, comparing the contemporary dining hall experience to that of her student days. "The food quality and local presence is even greater, and you have the expertise of the chefs. The whole food system has really changed in 35 years." Central Campus Dining Hall reflects many of those changes. There are weekly meet-the-farmer events and hands-on classes taught by a chef in the teaching kitchen. Glass jugs of infused water are prominently displayed, while the soda vending machine is tucked away near the bathroom. 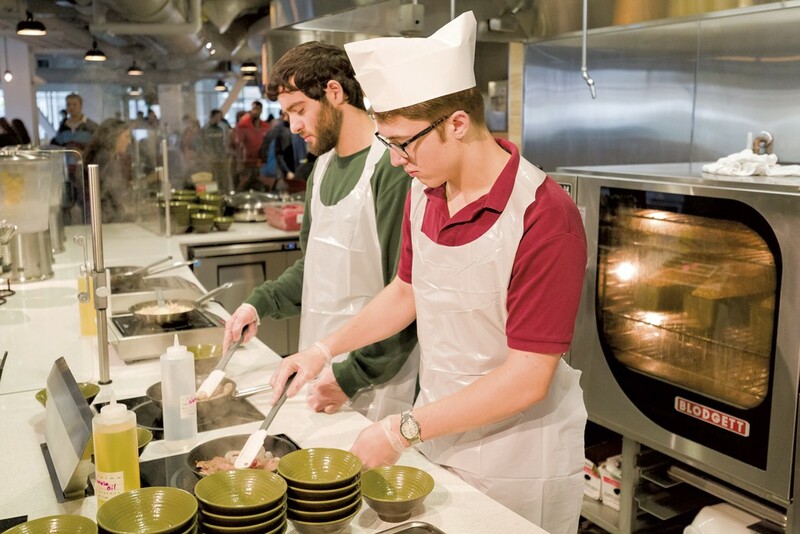 The Exploration Station is equipped with six individual cooking areas, at which students can tie on a disposable apron, slip on a pair of gloves and make their own meals with guidance from a pro. "It's easy to get down on the world, but these kids give me hope every day," said chef Gary Daluisio, who works with students at the cook-your-own station. "They're so well mannered and cordial, so respectful. It's certainly more fun and rewarding to do this than cook for them." Although the station is stocked with prepped ingredients, some students bring food from other parts of the dining hall and improvise, he said. "About 60 percent know what they're doing, and 40 percent have never touched a pan," Daluisio noted. On a Saturday morning in October, he taught students how to flip omelettes with a flick of the wrist. A cheering section gathered to applaud the effort, Daluisio said. Beyond learning that satisfying and useful skill, students gained confidence, he observed. Max Akey, a freshman from Williston who grew up in a restaurant family, cooked lunch for himself the other day, sautéeing onions, peppers, mushrooms and chicken and stirring in cheese sauce. He spooned the ingredients onto a roll to make a hot sandwich. "I recently learned that you could do this, and I've been back here ever since," Akey said. "I like being able to cook my own food. The [cooks] back here are great. They help you a lot." On a recent rainy evening, freshman Jaylyn Chalco took a counter seat to eat a dinner she had prepared: a baked potato stuffed with broccoli, mushrooms, cheese and bacon. "Back home, me and my mom used to cook together a lot," said Chalco, who is from the Bronx, "and it reminds me of that." In addition to the enjoyment students get from cooking their own food, the activity could lead to an enduring practice and lifelong knowledge, UVM educators say. "There's a possibility that you are socializing the students into being active rather than passive consumers of food," said Amy Trubek, faculty director of the food systems graduate program. "If you're cooking your own food, you're more purposeful about what you're eating. It's a learning activity." The $7 million dining hall opened at the start of the fall semester and is connected to the also-new Central Campus Residence Hall. Students who live in the 695-bed dormitory, the majority of whom are freshmen, are part of an initiative on campus called the Wellness Environment. James Hudziak, a professor of psychiatry at UVM's Larner College of Medicine, developed the multifaceted program, also known as WE. It teaches students to make healthy and productive choices about their lives in an environment that is conducive to doing so. The dining hall complements and promotes the values central to WE, according to Dennis DePaul, associate dean for student affairs. This approach involves offering healthy meals, providing nutritional information about the food, posting tips and tidbits about eating healthfully throughout the dining hall, and providing a dedicated space for teaching about food and cooking. Any student with a meal plan can take a class in the Discovery Kitchen. "This is an intentional approach to do lifelong learning around eating and eating habits," DePaul said, "as opposed to just feeding people." On an institutional level, UVM dining is committed to transparency in sourcing and pricing, he added. And, as a participant in the Real Food Challenge, a nationwide program that aims to increase local and ecologically sound food on campuses, UVM pledged that 20 percent of its food would meet certain standards of sourcing by 2020 (local, sustainable, fair trade and humane). The university exceeded that goal — it has already reached 22 percent — and has committed to 25 percent by 2020, according to administrators. "We're the University of Vermont, and Vermont has a way of doing things," DePaul said. "We want to do it the Vermont way, and we want to teach the Vermont way." Sarah Langan, executive chef of culinary education, teaches classes in the Discovery Kitchen. She was an instructor at the New England Culinary Institute for 22 years and, more recently, executive chef at the South End Kitchen on Pine Street before joining UVM. Langan said she was somewhat surprised at what a "good audience" the UVM students are. "They're smart. They want to know. They're engaged," she said. "They want to get right to the food. UVM college students are great culinary learners." About 80 percent of the students who attend her classes are female, Langan said, with 12 to 14 students in each class. She has taught them about vegetarian sushi, for example, and she's developed classes around featured vegetables: tomato, squash and kale. This week, Langan is offering a course called Cook Once, Eat Twice, and, in mid-November, she will present a class on preparing holiday side dishes. She plans to teach students who will be moving from residence halls to off-campus housing how to shop and cook on a budget. "You can't live on frozen pizza and ramen forever," Langan said. The original print version of this article was headlined "Dining 101"